“A pupil of Emmanuel Ondricek, Ms. Posselt became well known in New York and Boston, making her début with the New York Symphony under Walter Damrosch in 1928 with the Tchaikovsky Concerto. Posselt engaged in further study with Jacques Thibaud. As a mature artist, Posselt dedicated her talents to the works of Hindemith, Dukelsky (aka Vernon Duke), Piston, Barber, Hill, and Khachaturian. She helped to found the Bel Arte Trio, recording for Decca Records. She married Richard Burgin (1891-1982), violinist and concertmaster of the Boston Symphony, on 3 July 1940. After 1964, Posselt taught at the Florida State University School of Music, also founding the Florestan String Quartet. WHRA assembles a series of live-performance major violin concerti associated with Ms. Posselt’s long and active career, here extending from 1938-1967. My own interest in this artist centers on Posselt’s work with Serge Koussevitzky, particularly in the ‘unknown’ 1937 Concerto for Violin by Edward Burlingame Hill (1872-1960), given its premier in this performance in Boston, 11 November 1938. Hindemith and Posselt became close friends, to the extent of his baking Posselt a cake in appreciation of her performances of the Hindemith Concerto, given its American premier with Burgin, but soon passed on to Posselt, who championed it, along with his last two violin sonatas. Since Posselt gave the first Boston and Tanglewood performances of the Khachaturian Concerto in d minor, it proves most fitting that WHRA includes a driving, riveting account with Burgin from Boston’s Symphony Hall (28 October 1955), certainly competitive with inscriptions from Kogan and Fuchs, if not Oistrakh. Posselt possesses a real flair in her attacks and a sterling intonation, though her rubatos can be sentimental. Her cadenza, however, packs a musical bite, beautifully paced, and her entry into the orchestral tutti with Burgin should have heads and ears bobbing. The second movement is all Armenian syrup, and the last, appropriately, letting loose Armenian and Slavic dervishes. The 1939 Hindemith Concerto (25 March 1951) is led by Russell Stanger with the Harvard-Radcliff Orchestra. The Hindemith musical syntax moves fluently through Posselt, who plays with directness and sincerity. A product of the European political upheavals of the times, the music seems to offer a stately chastity and earnestness as a tonic to the raging convulsions and cataclysms that beset the lyric expression in this work. Despite some antique sonics from swishy shellacs, the Tchaikovsky Concerto in D ( May 1944) with Burgin and the Springfield Symphony Orchestra reveals Posselt’s long familiarity with the score – she performed it some thirty times in her career – executed with an ease and plastic fluency that might recall Milstein, though lacking in his nervous electricity. The Canzonetta permits Posselt some old-world portamenti that do not detract from the emotional authenticity of the playing. Posselt gave the premier of Barber’s 1948 revision of his a minor Concerto, but here presented in performance in Boston under Burgin (13 April 1963). The recorded (stereo) sound here with Burgin proves the most satisfactory of the preserved broadcasts, and the rendition itself has broad lines, reminiscent of interpretations from Louis Kaufman and Jaime Laredo. We sense a profound kinship between Posselt and this concerto, clearly affectionate and molded with eminently lyrical sympathy. The slow approach to the first movement may negate the dramatic contrast with the lyrical Andante for some auditors, but the slow movement has an undeniable, passionate breadth. Burgin elicits a consistently warm big resonance from his fellow Boston players. An effective conductor, about whom Joseph Silverstein had good things to say, Burgin impresses me in these broadcasts. "Ruth Posselt recorded, though not extensively, which makes the above three-disc memorial edition from West Hill Radio Archives so valuable. With the exception of the piano-accompanied set with Allan Sly, originally issued on the Album of Twentieth Century Violin Music Academy LP, all the items are live archive performances. The second disc starts with the Khachaturian Concerto in a performance given with the Boston Symphony and Burgin in 1955. We can hear her husky tone at its more warmly communicative in the second subject of the first movement. Throughout in fact she plays with vital, energising, technically eloquent control. It’s true that her vibrato can be rather one-dimensional but compensation comes from her razor sharp reflexes. The companion concerto is Hindemith’s. As could be anticipated from her performance of the e minor sonata, she is effortlessly attuned to Hindemith’s vocabulary. The Harvard-Radcliff orchestra is conducted by Russell Stanger in 1951. She has the work thoroughly under her fingers by now, having 'stolen' it from her husband, Burgin, the man who had given the work its American premiere in April 1940. 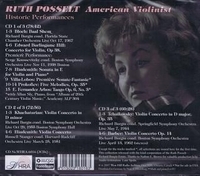 Posselt was Hindemith’s leading violin exponent in America and she played his concerto regularly, the last time in 1971. Purity and eloquence are the hallmarks of her playing, not showy tonal breadth. She first played the Tchaikovsky at that concerto début in 1928 and she played it thirty times during her career. Burgin is once again on the rostrum conducting the Springfield Symphony Orchestra in wartime. It does hang fire in places and once or twice Posselt ’s intonation frays but the slow movement is expressively played, her finger position changes subtle and attractive. The end of the finale is a bit messy but the audience is explosively enthusiastic. Finally there is the Barber. She had given the first Boston performance in 1941, the year after Spalding had premiered it. She also premiered the revised version in January 1949 with Koussevitzky in Boston. This is an affectionately moulded and highly sympathetic, warmly contoured reading. Throughout, her affinity is rock solid, her vibrato broadening triumphantly in the second movement. The finale is vivacious. A really splendid performance from an exceptional exponent of the American violin school. This is the kind of set I admire and the dedication involved in its compilation and presentation should not be underestimated. There are helpful biographical and performance details and fine photographs. Posselt was an important figure in America’s music-making life, and if she never quite reached the ranks of the elite, the works written for her, or promoted or premiered by her, were, as this set shows, hardly insignificant. She was a splendid, proselytising musician and this salute will be welcomed by her admirers everywhere. "